Sometimes you need to hire an expert to help with hard questions. With the help of the genealogy village—my fellow bloggers and the members of the various Facebook groups and JewishGen—I have been able to find and learn more than I ever imagined. But when it came to some of those mystery photos that bewildered and frustrated me, I decided it was time to find an expert, and the expert who came highly recommended—for good reason—is Ava Cohn, a/k/a Sherlock Cohn, the Photo Genealogist. 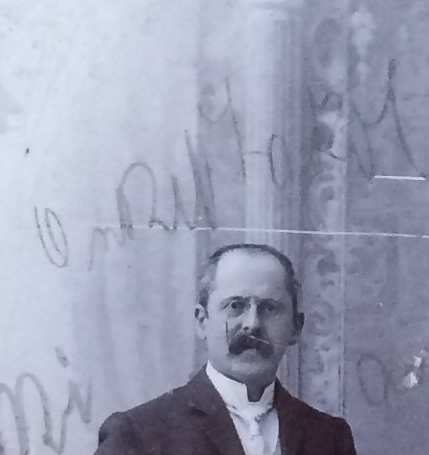 I had originally sent Ava this photo of my grandfather Isadore Goldschlager because I was curious about identifying the other people in the photograph. But Ava and I discussed it, and she concluded that without more information and more photographs, it would be impossible to make much progress identifying total strangers who lived over a hundred years ago. I really appreciated Ava’s honesty, and when she asked if I had any other photographs that might be more amenable to her analysis, I looked back to consider some other options. I sent her this photograph from Fred Michel’s album, which I had discussed here and here and here, but about which I remained somewhat mystified. I had concluded tentatively from my own analysis and comparison to other photographs and the inscriptions on the photograph that the older woman was probably my three-times great-grandmother Babetta Schoenfeld Seligmann, and the two men labeled Onkel Adolf and Onkel Jakob were probably Babetta’s sons, Adolf and James, brothers of my great-great grandfather Bernard Seligman. Adolf, like my great-great-grandfather Bernard, had left Germany and settled in Santa Fe, New Mexico, and James had moved to Great Britain. I had learned that James was not a common name for boys in Germany in the 19th century so it was likely that he was born Jakob and adopted the name James after emigrating. 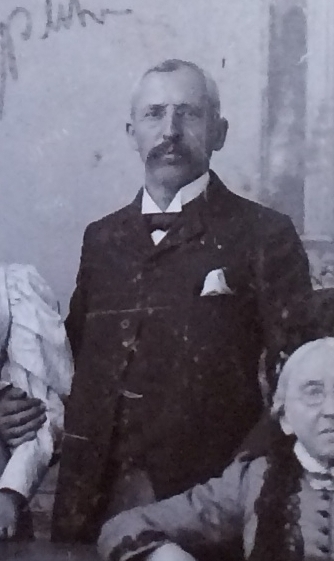 Also, my cousin Lotte, who had met James Seligman when she was a young girl, thought that “Onkel Jakob” resembled the man she remembered as James Seligman. But I was not at all sure who the two younger women were, especially the woman to the left in the photograph. 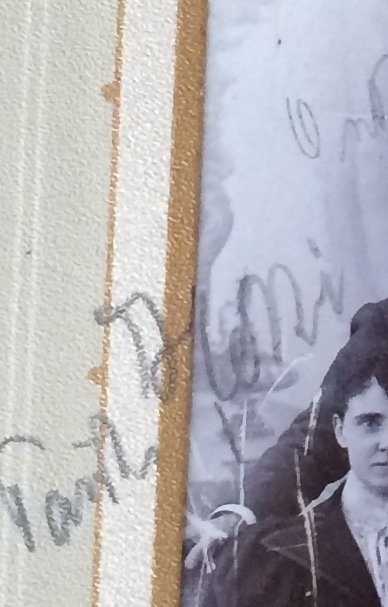 I’d asked on the blog if anyone could read the inscription near her picture, but no one was certain what it said. The woman in the center appeared to be labeled Anna Oppenheimer, but I couldn’t understand why she would be in the photo. Anna Oppenheimer was the daughter of Pauline Seligmann and Maier Oppenheimer and the granddaughter of Babetta. But why of all the grandchildren would only she be in this photograph, especially since her mother was not included, just two of her uncles? Ava studied the photograph as well as my blog posts, my family tree for the Seligmann family, and other photographs of the Seligmann family, and then sent me a detailed and thorough analysis of her own conclusions, which I found well-founded, fascinating, and persuasive. With her permission, I am sharing some of her report. 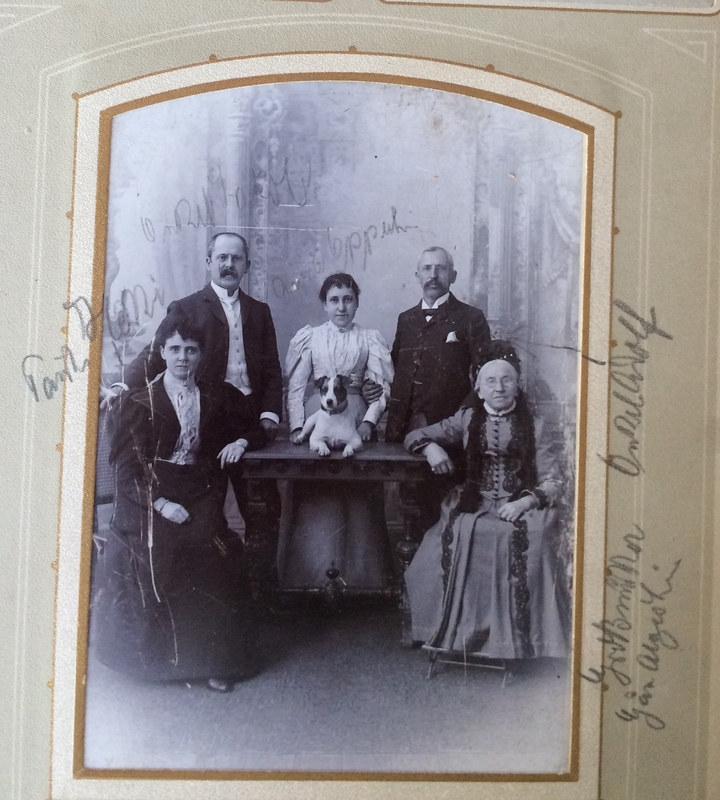 In the mystery photograph, the family is posed in a typical family grouping of five individuals seated and standing around a large library table upon which is a dog, perhaps the family pet. The photo has been taken in a photographer’s studio with an appropriate backdrop for the time period. The two individuals on the left hand side appear to be a married couple while the elderly woman seated on the right could be mother or grandmother to one or more of the individuals in the photo. The man on the right, probably a son and the young woman in the center holding the dog could be related but are not married to each other. To establish a year for the photograph, I looked at the clothing worn. Since what we know of the family’s comfortable economic status, it is logical that they are wearing up-to-date fashions, for the most part. The elderly woman, as is customary for many older women, is not as fashionable as the two younger women. Her dress, with multiple small buttons down the bodice, is a typical style of the 1880s as is her bonnet. The other two women are wearing clothing from the latter half of the1890s, post 1895. By this point in time the enormous leg-o-mutton sleeves of the 1893-1895 time period have become less full with the vestige of fullness above the elbow. The man on the left is wearing a high Imperial collar, common in the 1890s. Ava agreed that it was reasonable to conclude that the elderly woman labeled “Grossmutter Gau Algesheim” was Babetta Schoenfeld Seligmann and that the man on the right, labeled Onkel Adolf, was her son Adolf Seligman, brother of Bernard and a resident of Santa Fe in the 1890s. At that time Adolf was in his fifties (born in 1843) and unmarried. Ava thought that the man labeled Onkel Adolf in the photo appeared to be in his mid-fifties. Ava did not think the woman in the center was Adolf’s wife, Lucy, since Lucy would have been only about fourteen in the mid-1890s and did not marry Adolf until 1902. 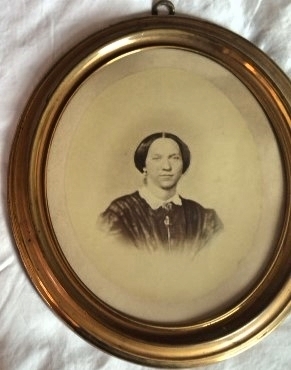 It appears that she is wearing a wedding or engagement ring in the photograph. 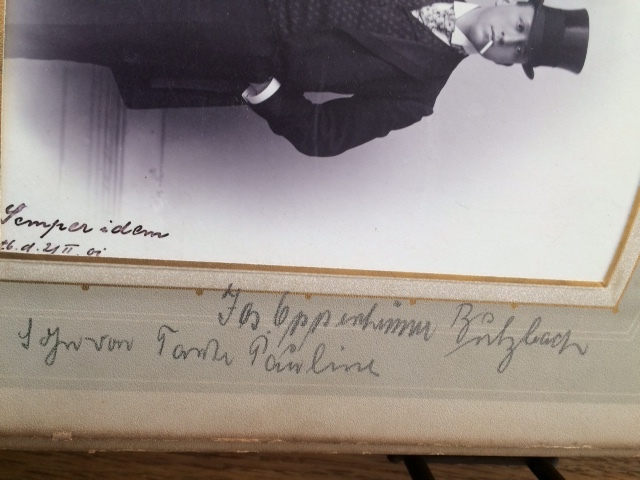 The writer of the inscription has used Anna’s maiden name, Oppenheimer, as opposed to her married name, Anna Kaufman, so, along with the absence of Max Kaufman in the photograph, I believe that this photo was taken before her marriage to Max. Again, having a marriage certificate for Anna and Max could confirm why the writer used Anna’s maiden name here instead of her married name. Unfortunately, I do not have a marriage record for Anna, and there is no record of any children born to her and her husband Max Kaufman so it is impossible to determine when exactly they married. That left the two remaining people in the photograph: Onkel Jakob and the woman sitting on the left side of the picture whose name I could not decipher in the inscription. Ava agreed that “Onkel Jakob” was James Seligman. So who was the other woman? Heni is a nickname for Henrietta and clearly shows the relationship with the writer of the inscription because of the informal use of a nickname. Tante (Aunt) could be one by marriage not necessarily by blood. In the mystery photo Heni appears to be about age 30-31. This made perfect sense to me. Ava speculated that perhaps James and Henrietta had come to Gau-Algesheim to celebrate their tenth anniversary with the Seligmann family, which would have been in 1897. I also recalled that Lotte had mentioned in an email dated July 6, 2015, that James and his English wife (whom Lotte referred to as Hedy) had visited “the continent” once. Lotte was born in 1921, so would not remember a visit in the 1890s, but the fact that James and his wife visited during Lotte’s lifetime in Germany makes it even more likely that they had in fact visited on earlier occasions. Lotte also said that James returned after Henrietta’s death in 1928. Ava even analyzed the dog in the photo. Given that the same dog appears in both the mystery photograph and the one of Bettina Arnfeld nee Seligmann (born 1875), I thought I’d include that here. It is clearly the same dog. I had considered that the dog may have belonged to the photographer but given how calm he/she appears in the photographs, I believe he was a family pet. The photo of Bettina was taken roughly 3 years after this one, circa 1900. The photo of Bettina may have been an engagement picture as she and Adolf Arnfeld married in 1900. Bettina Seligmann Arnfeld was the daughter of Hyronimus Seligmann, Babetta’s son and brother of Bernard, Adolf, and James, among others. She was Anna Oppenheimer’s first cousin. So whose dog was it? Certainly not James or Adolf since neither lived in Germany. Perhaps the dog belonged to Babetta? She is the only common link between the two young women pictured with the dog. 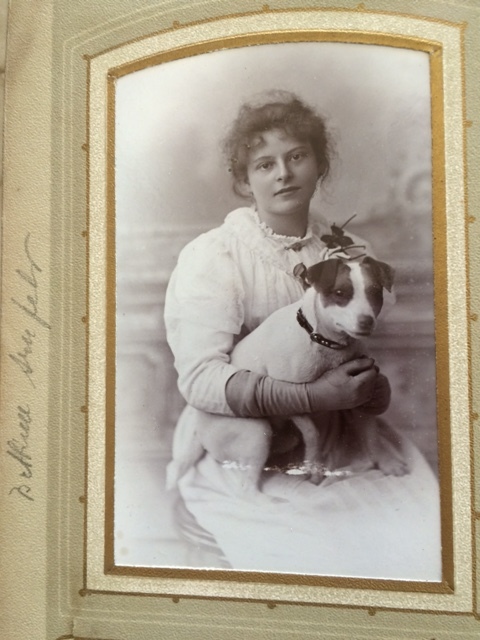 Babetta died 1899; if Ava is correct and the photograph of Bettina was taken in 1900, perhaps Bettina inherited the dog from her grandmother? I was quite satisfied and persuaded by Ava’s analysis of the family photograph. But she didn’t stop there. I had also supplied her with additional photographs to help with her analysis of the family photograph. For example, I sent her this one, which I believed was a photograph of Babetta as a young woman. 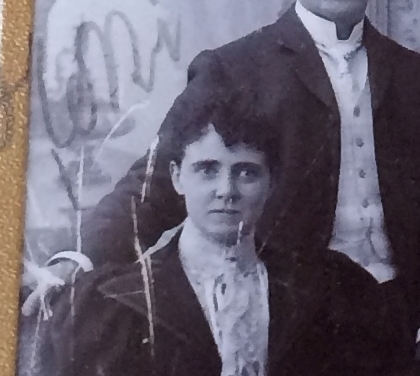 I had based that conclusion on the fact that another photograph that I paired with the one of the woman was labeled Grossvatter and thus presumably was my three-times great-grandfather Moritz Seligmann. I did a comparison of the older photograph of a young woman that you supplied. This photograph is roughly dated circa 1859-1861 based on clothing and hairstyle as well as the type of image, most probably a daguerreotype popular in the 1850s and very early 1860s. The young woman appears to be in her teens and no more than 20 years of age. This eliminates the possibility that this earlier likeness is Babetta who would have been 49-51 years old. But there is a possibility given the provenance of the photograph and the resemblance to Babetta that this is one of her daughters, Pauline or Mathilde. It is unlikely to be her niece/stepdaughter, Caroline. Given that the photo was obtained from the Michel descendants, Pauline is the most likely candidate. Further research, documentation and comparison photographs would be needed to make a positive identification. Although I was quite disappointed to think that this was not Babetta, the more I considered Ava’s analysis and the more I looked at the photograph of the young woman and the one of Moritz, the more I realized my error. The frames on the two photographs are quite different as is the style and the posing. I had just jumped to the conclusion that because Suzanne had sent these two photographs in the same email that they were of a couple. That’s why sometimes you need to hire an expert! I was quite surprised but also persuaded by what Ava had to say about the identity of the people in this photograph; she is quite certain that the woman is in fact Henrietta Walker Templeton, and the more I studied the photograph, the more I agreed. 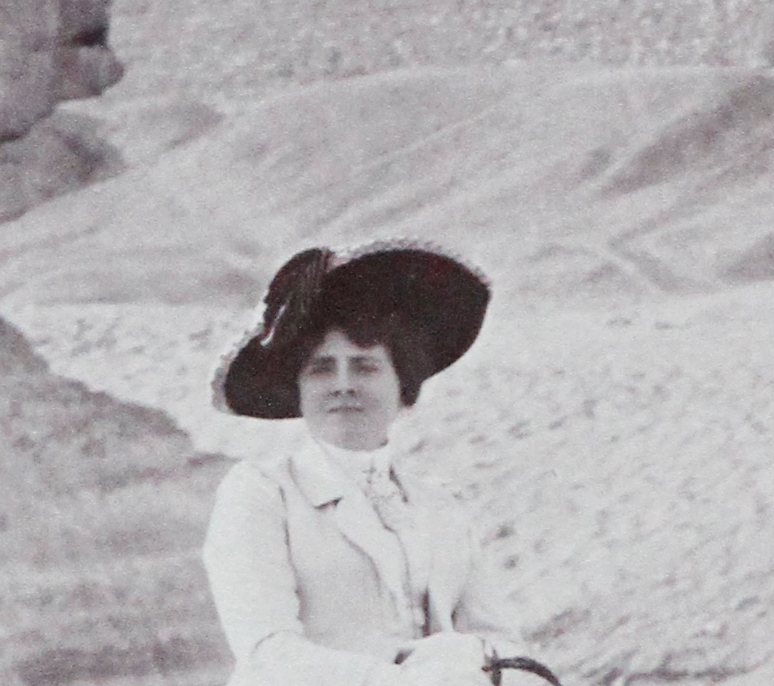 The Egypt photo is roughly dated based on her suit and hat as being taken in 1910. That would make Heni 44 years old. Her face has aged from the earlier photo and she’s put on a bit of weight, not uncommon approaching middle age. She is very stylish in the 1897 photo and likewise in the 1910 one. In both, she has chosen an up-to-date suit rather than a dress. Her dark hair is the same style. Notice the “dip” in her bangs on the right side of her forehead. It’s the same as the earlier photo. Her eyebrows, nose and mouth are the same as is the overall attitude captured by the photographer. After I read Ava’s comment, I checked the emails that Lotte had sent me and saw that she had described James’ wife as “big and pompous.” The woman Ava concluded was Henrietta certainly does have a certain air of superiority in both of the photographs. Also, I have absolutely no record of any kind supporting the existence of a Seligmann sister named Minnie, so already had had questions about Davita’s description. Thus, I was open to the idea that it was not Minnie, but someone else. I hadn’t considered Henrietta since I believed that the man was Adolf, as Davita said. 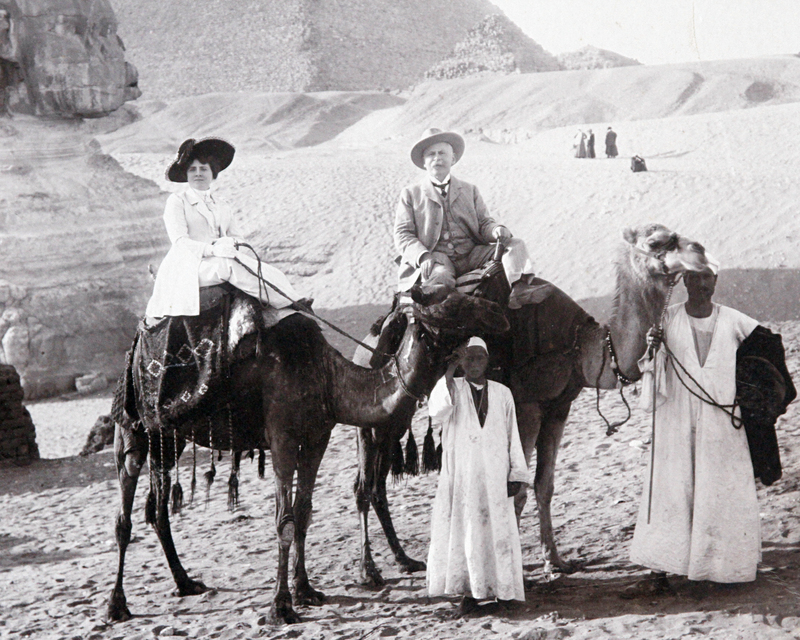 Why would Henrietta from England be riding a camel in Egypt with her brother-in-law Adolf, who lived in Santa Fe? Thus, although without more photographs and/or records we cannot be 100% certain, I am persuaded that Ava’s conclusions are correct about the likely identities of the people in the group photograph, the portrait of the young woman, and the Egypt photograph. It was well worth the fee I paid to have the benefit of Ava’s expertise. I highly recommend her to anyone who has questions about an old photograph. If you are interested, you can email Ava at Sherlock.cohn@comcast.net or check out her website at http://sherlockcohn.com/ You will probably have to wait quite a while because her services are very much in demand and she devotes a great deal of time to each project, but it will be worth the wait. 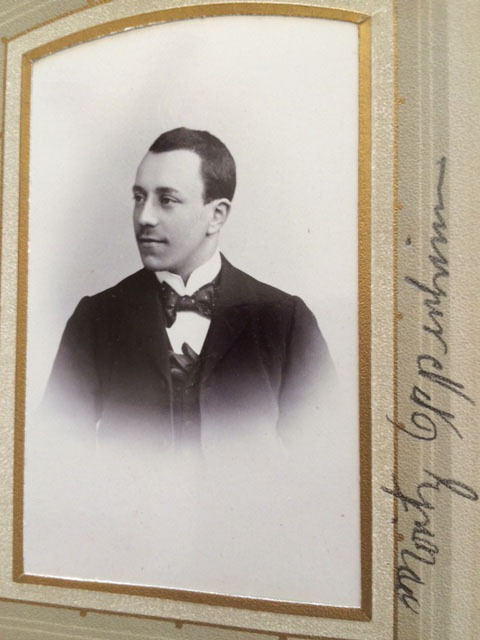 Several weeks ago I received a comment on the blog from Angelika Oppenheimer, the granddaughter of Moritz James Oppenheimer, whose life I wrote about here. He was the successful businessman who owned the horse breeding farm in Germany that was appropriated by the Nazis. Moritz Oppenheimer died in 1941, an apparent suicide after being “visited” by the Gestapo. 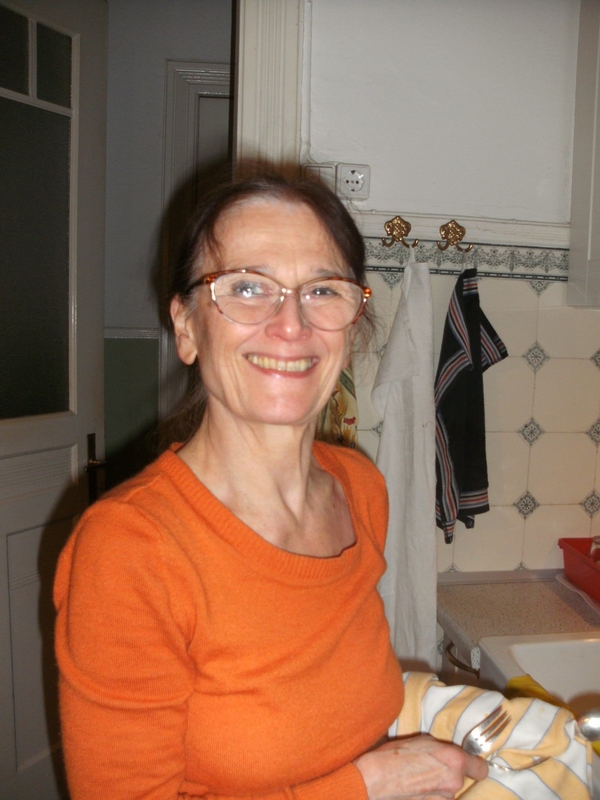 Angelika found the blog because she was interested in knowing more about her grandfather’s family, and I am grateful because I now have learned more about her grandfather’s life and about the lives of his children and grandchildren. According to a resume provided to me by Angelika, in 1901 he founded the Mitteldeutsche Papierwarenfabrik situated in the Hanauer Landstraße and the Rheinische Sackfabrik. 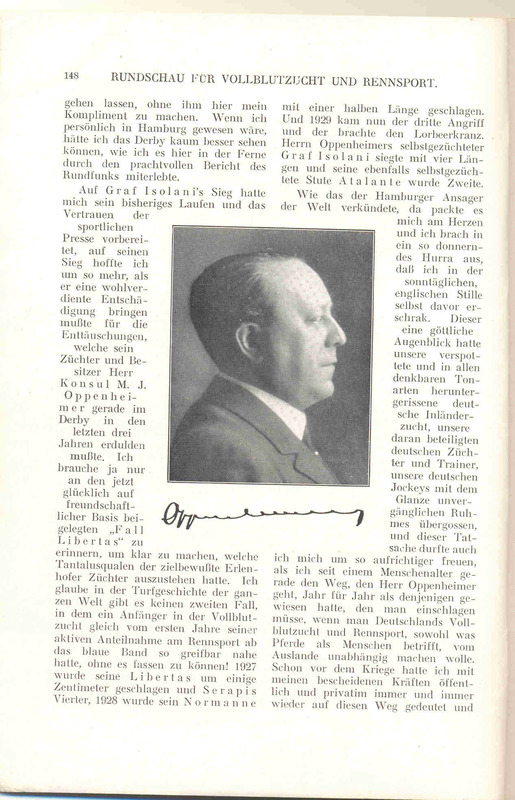 Moritz was a member of the board of directors of several companies throughout Germany, including the Kostheimer Cellulose und Papierfabrik (Kostheim-Mainz), the Danziger Verpackungsindustrie at Danzig, the Fabbrica Italiana Sacchi Ercole at Villanovetta, the Mechanische Papiersackfabrik A.G. at Saarbrücken, the Sankt Georg Verlag at Berlin and the Bayrische Reitschule at Munich. 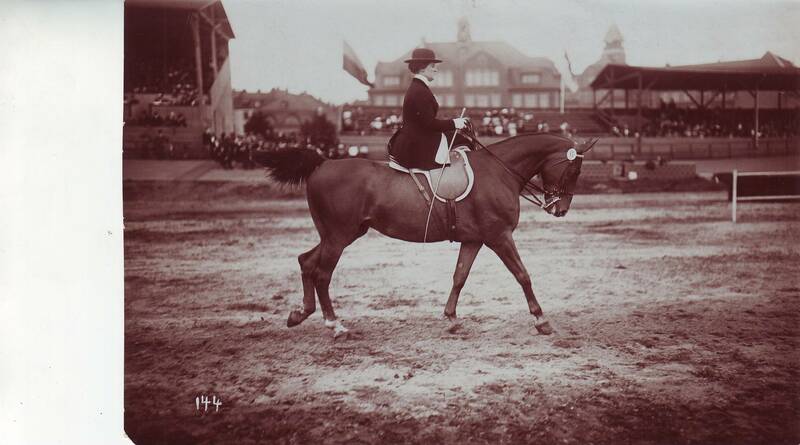 Emma Neuhoff was a gifted musician and an excellent horsewoman, according to her granddaughter Angelika. 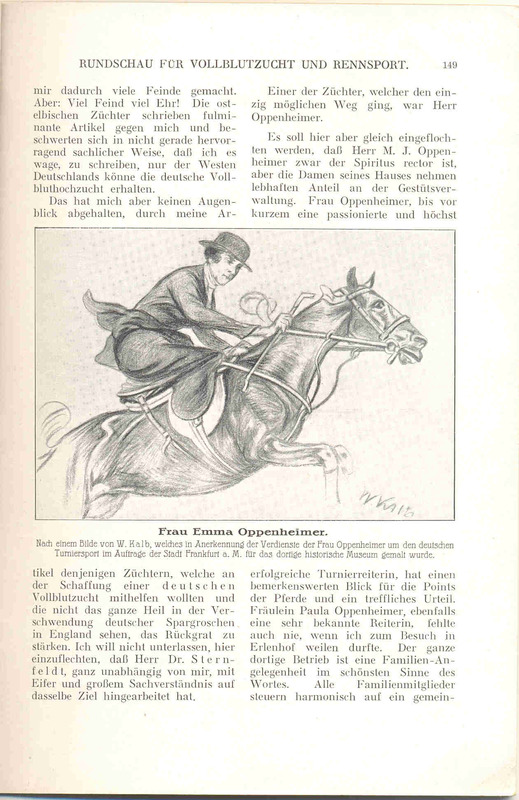 Here are two pages from a German magazine discussing M.J Oppenheimer and his wife Emma. I think it’s a publication about thoroughbred breeding and racing, but I cannot read the pages. Perhaps some kind German-speaking reader can help? 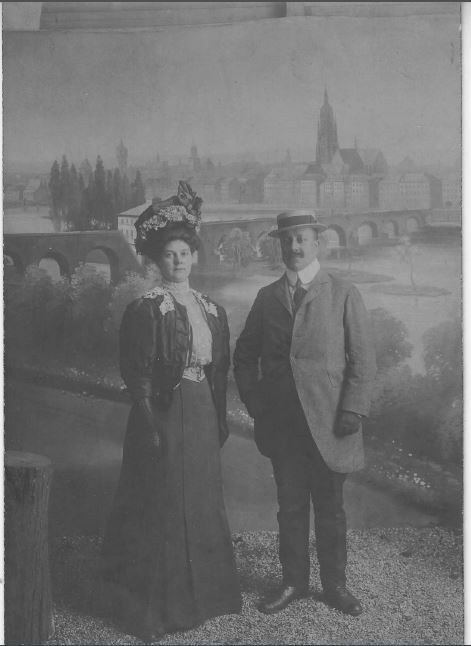 Moritz and Emma had two children: Paula (1902) and Walter (1904), Angelika’s father. Paula married a Catholic man named Rudolf Spiegler, a doctor, and converted to Catholicism; they had two children, Gabriele and Wolfgang. Paula and her family did not face any persecution during the war. I was born on 10 July 1904, son of the industrialist and thoroughbred horse-breeder Consul M.J. Oppenheimer, in Frankfurt am Main. After three years at preparatory school, I attended the Goethe Gymnasium in that city for nine years; I left school, having obtained my school leaving certificate (Abitur), at Easter 1923. After studying for six terms at Frankfurt University (Law and National Economy), I sat the examination for articled clerk at the Frankfurt Higher Regional Court [Oberlandesgericht]. After a period as an articled clerk at the court in Frankfurt, in 1927 I took my doctorate under Professor de Boor. 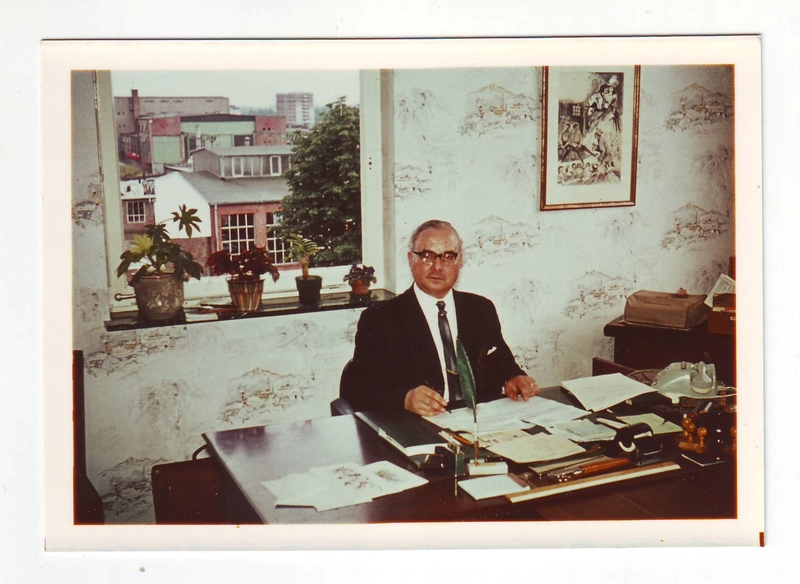 After a lengthy period of practical training as a fitter in an engineering works, and as a paper-maker in paper-mills, I then joined my father’s paper-products company, the Mitteldeutsche mechanische Papierwarenfabrik, in Frankfurt. From 1931 I was Chief Company Secretary of this company belonging to my father as sole owner. At that time it was the largest company of its kind in Germany, and for a period employed together with its subsidiaries more than 1,000 people. In 1932 I built a major subsidiary factory for my father’s company in Berlin. My father was arrested in the autumn of 1933, at the instigation of two [NSDAP] party members (August Hartmann and Helmut Vögler) working in collaboration with the NSDAP. His entire assets were put in the hands of the lawyer [Rechtsanwalt] Max-Ernst Cuntz as prospective administrator. A bankruptcy was thus brought about, and the assets liquidated at the lowest rate, the said lawyer Cuntz selling each item at a rate far below its value, for the most part at one twentieth of purchase value. The stud farm and stables, for example (probably the biggest and best of their kind in Germany), were disposed of at a price below the level of profits from racing for the following year. The case was similar in respect of the factories, share portfolios, Hippodrome A (whose director I also was, and all shares in which belonged to my father), etc. I myself was immediately removed without compensation from all my posts by the lawyer Cuntz, on the grounds of my non-Arian status. I was also compelled to surrender my own stables, representing an approximate worth of between 70,000 and 100,000 Reichsmark, without receiving any compensation. My father was also quite illegally disqualified from receiving the stud prize. To satisfy the rules in this latter regard, for years my mother and I continued to hold two mares for my father, so that he could legally be assigned 10% of all racing prizes won by horses bred by him, in accordance with stud rules: except with the proviso that no stud prizes could be paid out to a Jew; the authorities retained this annual sum, comprising up to 100,000 Reichsmark, and finally had it credited either to themselves or to the Union Klub. My father, who was perfectly healthy, became ill owing to ill-treatment during his detention. He was declared unfit for detention in 1934/5, and finally took his own life when he was about to be arrested again in 1941 preparatory to being sent to a camp. I myself with my mother had founded the company Paverk, Gesellschaft für Papierverarbeitung in December 1933. As I could not appear in person as a holder of shares in a limited company, an Arian uncle of my mother acted for me. Then, in 1937, I transferred this share in trust to my father-in-law Otto Zier, now [April 1945] of Friedberg in Hessen, Dieffenbachstrasse 25, together with a further 20,000 Reichsmark of shares created in settlement of my assets, so that, of the total sum of 40,000 Reichsmark in shares of the above company, 10,000 Reichsmark of my mother’s and 30,000 of mine belonged in trust to my father-in-law. By the beginning of the war, however, with a nominal capital of 40,000 Reichsmark the company had an actual value of some 250,000 to 300,000 Reichsmark, as, thanks to the diligent efforts of my employees, the company had been highly successful under my stewardship. My wife having died suddenly from pneumonia in April 1935, at the beginning of 1941 my father-in-law saw fit to attempt to misappropriate the shares that had been transferred to him in trust. As, owing to my status as a person of mixed blood, I myself could not appear as a plaintiff, I assigned my claim to my mother, who instituted legal proceedings and won her case, at both first and second instance. The papers relating to the case are still available in their entirety: reference 2/5 2/9 0 30/41. 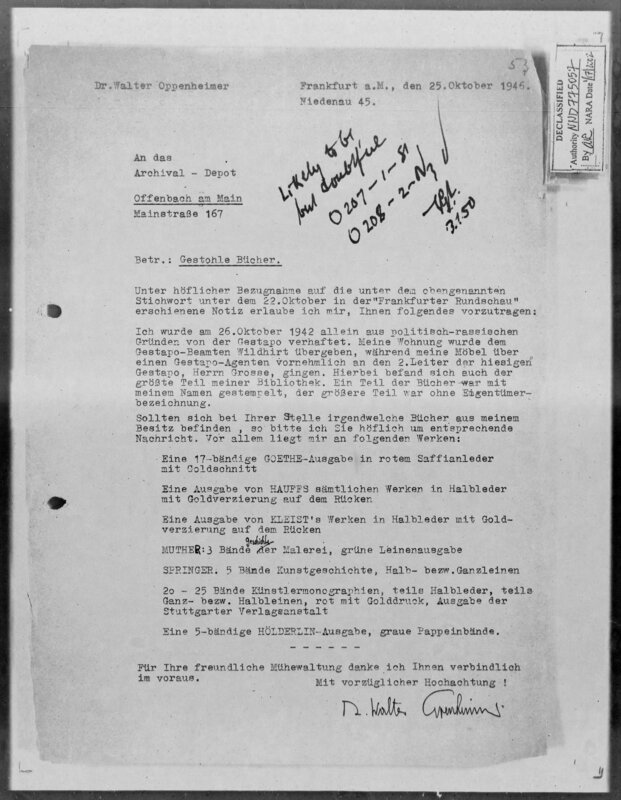 These papers clearly demonstrate how Zier attempted to influence the court using the entire gamut of National-Socialist arguments, with reports against me and the company being sent to all sections of the Party, including district and financial counsellors (Kreis- und Wirtschafts-berater – [advisors to the Gauleiter under National Socialism]) Eckhardt, Degenhardt, and Avieny, the DAF [Deutsche ArbeitsFront – national trades union organisation under the National Socialists], the Gestapo, etc. At last instance, the High Court [Reichsgericht] awarded my mother only 10,000 Reichsmark unconditionally, while presuming improper concealment [unsittliche Tarnung] in respect of the remaining 20,000 Reichsmark. This finding is the subject of a new trial before the District Court [Landgericht] in Frankfurt (2/5 0 36/44), over whose outcome in my mother’s favour there may be little reason to doubt. Quite apart from these machinations on Zier’s part, which caused not only the Paverk company but also my mother and myself endless spiritual and material harm, we had also much else to suffer at the hands of the NSDAP. When the company was heavily bombed in 1943, and totally bombed out in February 1944, Herr Hermann of the Gauwirtschaftskammer [regional economic organization under National Socialism] prevented the rebuilding of the plant and re-acquisition of machines. In addition, I myself was arrested by the Gestapo in the autumn of 1942, the only charge against me being my engagement to an Arian woman in contravention of the rules. I was not released again until 28 May 1943. My entire household effects to the value of about 70,000 Reichsmark (peacetime value), including art collections etc., had meanwhile been taken, and the Gestapo official Wildhirt installed in my flat. In 1943, my fiancée was conscripted to work at the Mayfahrt company under the harshest of conditions at the direct instigation of the Gestapo. The main initiator in these matters was Zier, who did not, however, proceed in his own name, but employed the services of his friends Fabian-Gramlich (insofar as I have been able to determine up to now), while my furniture was removed by a painter by the name of Baumann, who did work for the police. I married on 11 April 1945, immediately after the liberation by the Americans. I was allocated a flat at Freiherr vom Stein Strasse 56/1, which I immediately had redecorated and furnished with furniture belonging to my wife, only to have the flat abruptly requisitioned by US soldiers on 26 April 1945. I, David M.B. Richardson MCIoL, certify this to be a true and fair translation of a photocopied document in German provided to me by Frau Angelika Oppenheimer, daughter of Walter Oppenheimer. Walter’s essay reveals so much about the hate-filled and carefully plotted system used by the Nazis to crush, humiliate, and destroy the Jews. First, they stripped them of their property, then they stripped them of their dignity, and finally they killed them and stripped them of their lives. Moritz Oppenheimer, a man of great wealth, was brought to his knees by the Nazis and demoralized to the point that he took his own life rather than be subjected to further humiliation and abuse and ultimately murdered. 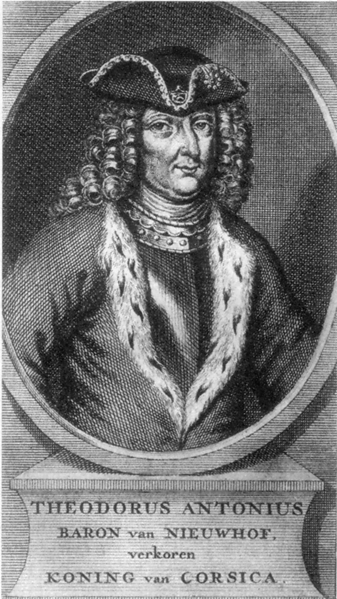 One aspect of that humiliation and abuse not mentioned in Walter’s essay was the forced annulment of his marriage to Emma Neuhoff because of Moritz’s Jewish background. 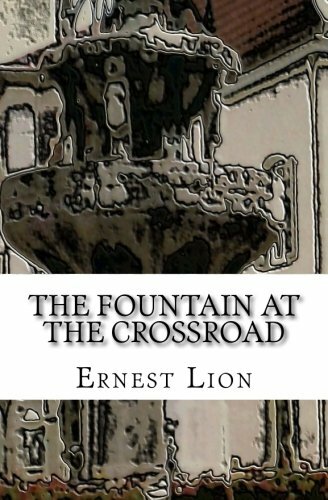 Moritz and Emma’s son Walter, a highly educated and successful man in his own right and not even raised as a Jew, was denied his property and his rights and had his own father-in-law betray him and his trust after his first wife died in 1935. According to Angelika, Walter’s brother-in-law was in the SS. Only because Walter had a non-Jewish mother who bribed the local Nazi official in Frankfort was he allowed to survive. I was arrested by the Gestapo the 26th October 1942 for purely political and racial reasons. My apartment was handed over to the Gestapo officer Wildhirt while my furniture was first and foremost transferred by a Gestapo agent to the second principal of the Gestapo here, Mister Grosse. The biggest part of my library was taken away with it. A part of the books was rubber-stamped with my name but the bigger part of it was without the name of the legitimate owner. A five volume edition of HÖLDERLIN, grey pasteboards. Many thanks indeed for your efforts in anticipation. With all due respect to you! I was impressed by the diversity of subjects in his library and by how much he valued his books. I also was struck by how polite and almost deferential he was in asking for the return of what was already rightfully his own. At least some of the books were returned and remain today with Angelika. 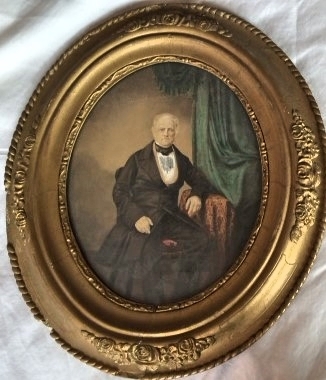 Here is a photo of her father Walter. 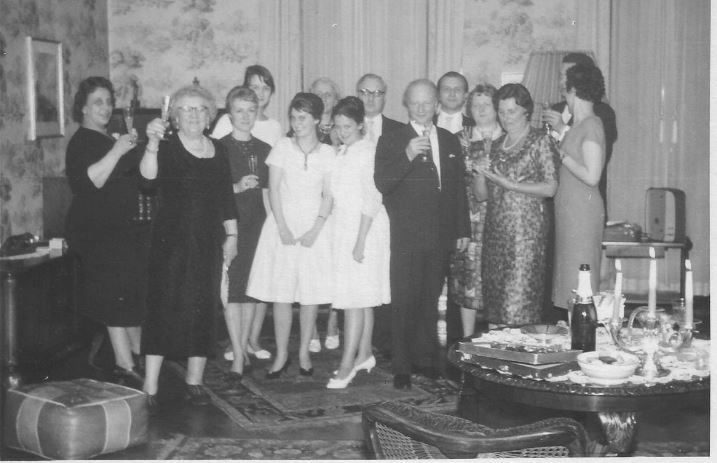 Angelika shared this photograph of her family and friends at her Lutheran confirmation celebration taken in about 1961. From left to right: Paula Oppenheimer Spiegler (paternal aunt) , Emma Neuhoff Oppenheimer (grandmother), Christiane Wiegandt (Angelika’s maternal cousin), Christiane Bott (classmate), Sylvia Berres (classmate), Elsa (nee Wiegandt) Oppenheimer (Angelika’s mother), Angelika,, Walter Oppenheimer (Angelika’s father), Karl Wiegandt (Angelika’s maternal uncle), Karli (Angelika’s maternal cousin), Annie Wiegandt (wife of Karl), Herta Dorner (friend), Gabriele Spiegler (Paula’s daughter), either Wolfgang Spiegler or Gabriele’s husband. I feel very fortunate that Angelika was able to find me through this blog. 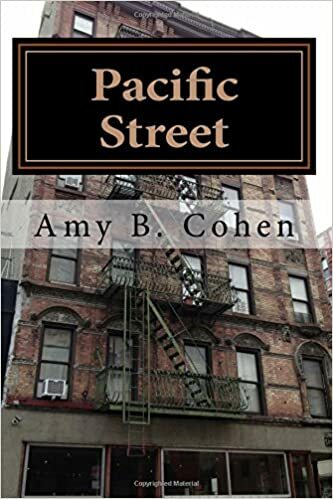 Her family’s story is yet another lesson in the destructive power of prejudice, on the one hand, and the ultimate power that human beings have to survive and overcome those destructive forces, on the other. Angelika and I have lived very different lives; we grew up with different religious backgrounds, we live in different countries, we speak different languages. My immediate family lived through World War II in relative safety; hers was scarred forever. But despite those differences, we know that we share a common history that ties us together as cousins. Isn’t that remarkable? I learned something important from my first Mystery Photo post. Keep it simple. Too many photos makes it too confusing for people (and for me). Although a lot of people read the post, almost no one commented. I did go to Facebook and got some feedback about whether or not these two photos are both Babetta Schoenfeld Seligmann. Most people said yes, some said no. 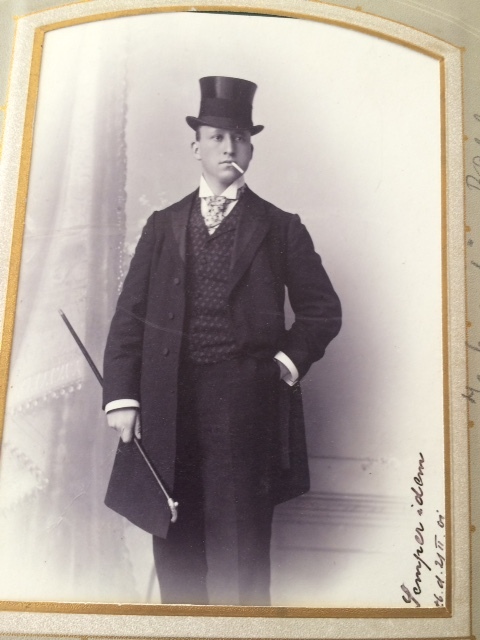 For my second post involving the mystery photos from the Michel album, I want to start with some photographs that are clearly labeled as members of the Oppenheimer family and that present no mystery. The Oppenheimers were the children of Pauline Seligmann, sister of my great- great-grandfather Bernard. 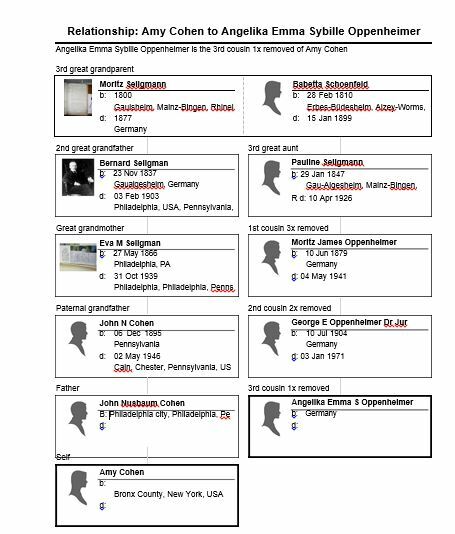 She and her husband Maier Oppenheimer had five children: Joseph, Martha, Anna, Ella, and Moritz, according to the Westminster Bank‘s family tree for Pauline. The Michel album included clearly marked photographs of the two sons, Joseph and Moritz, and one of the daughters, Ella. Joseph was born in 1875 and died at Dachau Concentration Camp in October, 1940. I wrote about Moritz Oppenheimer in detail here. He was the wealthy industrialist who owned the horse breeding farm and who died in May 1941, under suspicious circumstances after being “questioned” by the Gestapo. 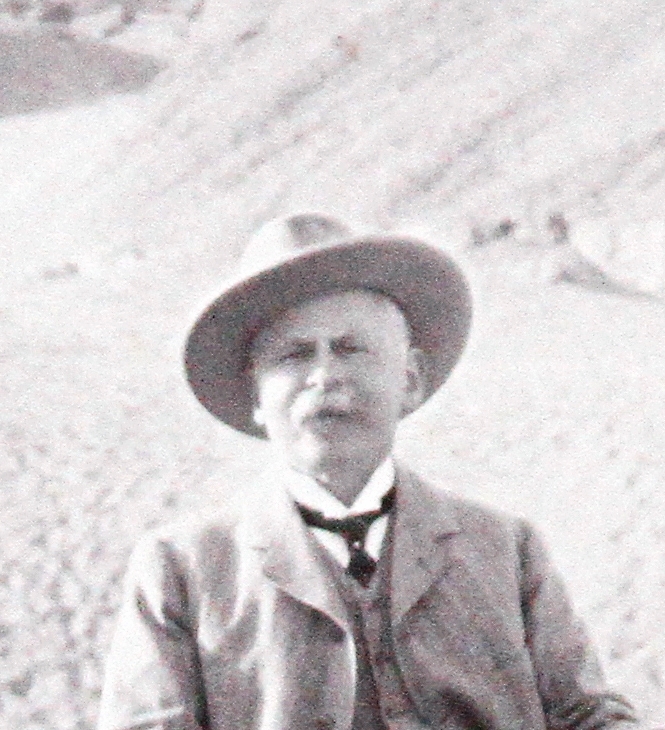 Moritz was born in 1879. How old do Joseph and Moritz appear to be in these photos? I am guessing between 25 and 35, meaning the photographs were taken between 1900-1910. Does that seem right? To Wolfgang and me, this seemed to say Milla Oppenheimer. But neither Joseph nor Moritz Oppenheimer married a woman named Milla and there was no sister named Milla. I posted the photograph on Facebook for some feedback, and one member of Tracing the Tribe pointed out that the M could really be an E, except for the dot over what seems to be an I. Then another member pointed that the “dot” was really part of the framing around the photograph, not part of the name written on the side. So I believe that in fact this is Ella Oppenheimer. According to the family tree for Pauline Seligmann Oppenheimer prepared by the Westminster Bank, Ella never married or had children and died during the Holocaust, although I cannot find her in the Yad Vashem database. I did find in the JewishGen database entitled “German Towns Project” an entry for Ella Oppenheimer from Butzbach, who had been born there June 21, 1878 and had moved to Frankfort in 1939, (That database was created by asking officials in numerous Jewish towns to list their former Jewish residents and their fate, if known.) But that database had no information about how or where she died. So these three photographs are pretty clear to me. 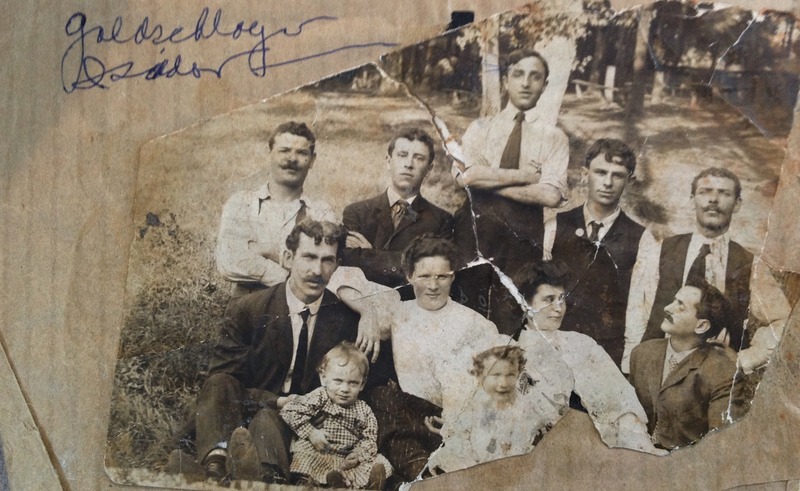 The next possible photograph of one of the five Oppenheimer children is the woman at the center of the photograph I posted last time. Here is a closeup of her face. 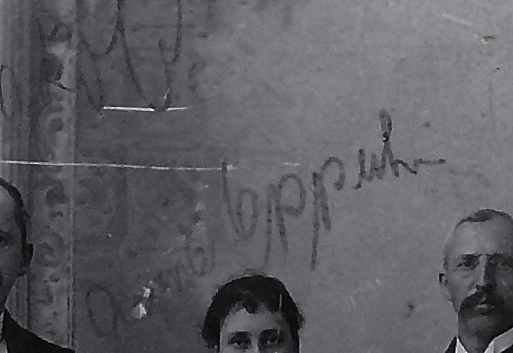 It certainly looks like it says Anna Oppenheimer over her head, doesn’t it? 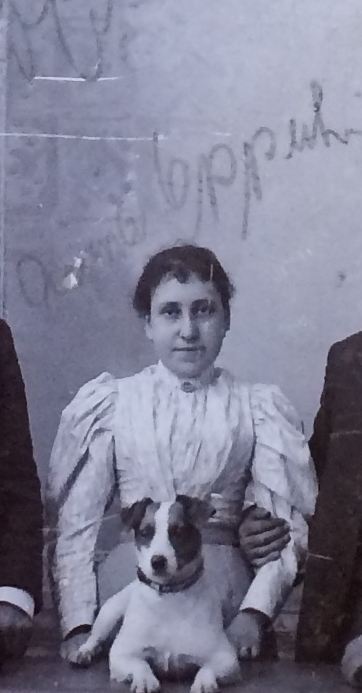 Anna, another sister of Joseph, Moritz, and Ella, was born in 1877, and she died in 1908. 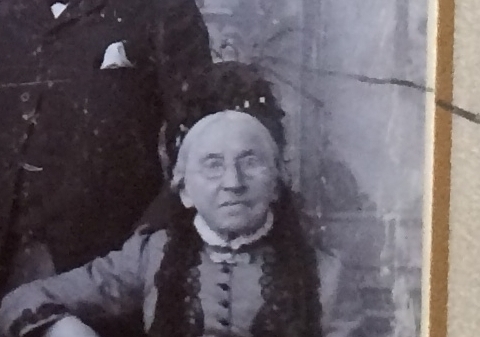 In my earlier post, I assumed that the older woman in this photo was Babetta Seligmann, meaning the photo would have been taken in about 1890 or so since Babetta was born in 1810. But Anna certainly does not look thirteen in this photograph. How old does she look? If I guess that she is 30, that would mean the photo was taken in 1907. That would make Babetta almost a hundred years old. Or maybe it’s not Babetta. Maybe the older woman is Pauline Seligmann Oppenheimer, who was also born in Gau Algesheim. Paulina was born in 1847, so she would have been sixty in 1907. That woman could be sixty (not that sixty-year old women look like that today). But then why is she labeled Grandmother? Pauline was not Franziszka Seligmann’s grandmother; she was her aunt. 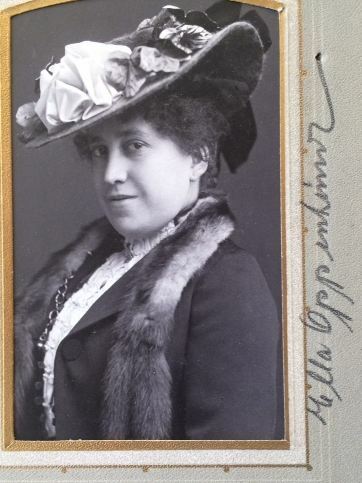 In the photo of Joseph Oppenheimer, she is referred to as Tante Pauline. Franziska’s grandmother from Gau-Algesheim was Babetta. Fred Michel’s maternal grandmother was Rosa Bergmann Seligmann; she did live in Gau-Algesheim. She was born in 1853 and died in Gau-Algesheim in 1899. But that woman does not look 45, does she? I still think the elderly woman is Babetta. But then how could that be Anna Oppenheimer? Am I misreading the name above her head? So my only question for today: could that be Anna Oppenheimer? That’s it for this post. I will return to the other people in this photo in a later post once I have some feedback. I am trying to narrow down the date so I can piece together the other parts of this puzzle.